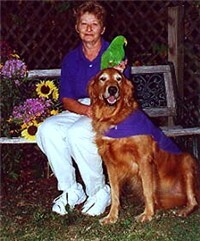 Mary joined K-9s in April of 2001 with Moss, her Solomon Island Eclectus Parrot and Andy, her Golden Retriever. Mary became very active in K-9's For Compassion, becoming the Vice President in 2002. She had innovative ideas about the group, pursued fundraising aggressively and visited regularly, promoting the group every chance that she had. She was a member who made a profound impact on the group, and her legacy will live on. Mary's dedication to our group was invaluable. Without her, our group would not be where we are today. Mary departed this life on August 10, 2007 and will be forever missed by family and friends. We are grateful for the memories. Last updated: November 5, 2007.